Photo: Modo CEO Patrick Nangle at the wheel of a Rav4 hybrid. Image courtesy Modo. Vancouver leads North America with about 3,000 shared vehicles. Now, if it could just electrify the fleet. Maybe we should have marked it on the calendar? Ten years ago: our personal car-free anniversary. The day we broke free from hefty insurance premiums, maintenance costs and parking fees. Free from the temptation to reach for the car keys when a bike would do. Free to use the precious space that had been liberated in our garage. Free from the responsibility – ecological and economic – that goes along with owning a car. But then it never really felt like a clean break from motordom. We may have given up our worn-out 1991 Mazda 626, but after putting down $750 for joint membership in car share co-operative Modo, we, along with several thousand others, became owners of a whole fleet of vehicles. Transportation in this city and province still revolves around cars. As our family has grown over the years from two to three to four, there’s always been the temptation to buy our own. That we’ve remained car sharers this long is largely down to Vancouver’s increasing cycle friendliness, as well as reasonably good, albeit strained, transit system. Paying as we go with Modo has served us well when combined with our bikealot lifestyles, and the list of other options for those times when we need four wheels has just kept growing: Zipcar, car2go and Evo. Peer to peer Turo (“Airbnb for cars”) recently launched in BC and there’s even a hybrid bike/electric vehicle (EV) share, Veemo, being piloted at UBC. Actually, Veemos are three-wheels, but you get the picture. When, a decade ago, we joined Modo, or the Co-operative Auto Network as it was known before its brand makeover in 2011, we booked a car over the phone and then retrieved the car key from a secure box at the back of the car. There were slips of paper to fill in with miles driven and gas bought at the beginning and end of every trip. Now, you can book by app, web or phone, in increments of 15 minutes. Trip logging is automated and you key in and out with an electronic, key ring fob. There’s a good variety of vehicles. We now have a 2017 Hyundai Elantra on our block where, until recently, the nearest family sedan was based a five-minute bike ride away. When elderly relatives visit, there’s various minivan options and a pick-up truck down the road is my go-to for lugging furniture. If we don’t drive during the month, we don’t pay anything. Modo started life 20 years ago as an SFU thesis project with two cars and 16 people in Vancouver’s West End. Today, it has over 50 different vehicle models in a 600-strong fleet spread across Metro Vancouver, in Greater Victoria, Saanich and Nanaimo. The Co-op’s 18,000 members can book anything from an eight-seater Kia Sedona mini van in Fairfield, Victoria, to a 2017 Toyota Prius V at Vancouver City Hall, a 2015 orange Scion coupe at Lafarge Lake-Douglas SkyTrain in Coquitlam or a Nissan frontier truck outside Surrey City Hall. It’s not perfect. Don’t try last-minute booking that seven-person mini van at long weekends. Plus, the two-way carshare model, exemplified by Modo and its counterpart Zipcar, where you have to return the car back to its home location at your pre-chosen time, can seem inflexible. Modo’s fees have also been creeping up; in the last year, they went from $4 an hour and $0.40 per kilometre to $5 an hour and $0.25 for Modo Plus (i.e. shareholding) members. Nangle defends the new pricing structure as necessary to cover basic operating costs, for better quality cars and better maintenance of vehicles so they’re not scratched and dented. They’re also cleaned more often. Certainly, for occasional drivers like us, carsharing still means thousands of dollars a year saved over solo ownership, while enjoying the benefits of a diverse and regularly updated fleet of vehicles. There’s also those carsharing perks: being able to park in resident-only spaces, not having to worry about insurance and gas or changing the winter tires. It’s covered. What’s more, Modo’s day rates, up to 250 km over 24 hours for $80, with taxes included, are hard to beat and the winter season overnight rates, from 7pm to 9am of $12.50 plus $0.25 per km, are a gift for night owls. Are you going one way? Sometimes you don’t want to return a car to its original starting point as with the Modo two-way model. 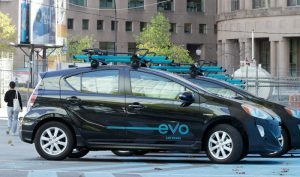 “Floating” or “one-way” car shares car2go and Evo, which launched in Vancouver in 2011 and 2015, have gone some way to filling the gaps, particularly as they grow their Vancouver fleets and expand the geo-fenced “home” areas in which their cars operate. The one-way carshare model is ideal for urban trips: going to a restaurant, cinema or ball game. You can book any free car via an app, drive to your destination and walk away. 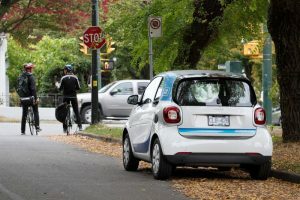 Vancouver has the largest member base of the 11 North American locations that Daimler-owned car2go operates in, says Tim Krebs, the company’s communications manager. There are 137,000 Vancouver members. Unlike Modo, with its diverse fleet, car2go’s 1,100 vehicles are a few select models: the familiar Smart cars, as well as more roomier Mercedes-Benz CLA and GLA models. The car2go home area spans most of Vancouver and North Vancouver, with satellite parking at UBC, BCIT and the Pacific Gateway hotel for airport access. You can go outside the home area, but you must return back home to end your trip. With BCAA-owned Evo, it’s been a similar story of rapid expansion. “We’ve grown the fleet from 250 to 1,250 in just a short two and a half years,“ says director Tai Silvey. As well as Vancouver, Evo is in New Westminster (since May), North Vancouver and university campuses like UBC, SFU and BCIT. It has satellite parking also at Grouse Mountain and the airport. Evo’s fleet is 100% comprised of Toyota’s hybrid subcompact, the Prius C, a roomy hatchback that can fit five people and bikes or skis on the roof rack. You can start an Evo trip using the app or, unlike with car2go, a dedicated keycard, with reservations possible up to half an hour beforehand. Customer support is good and a simple, but useful, feature is the Evo button on the dash to make hands-free calls to customer support. Which one to join? A lot of people join both as membership fees are negligible and it gives you more driving options. Both companies also have promotions where they waive the sign-up fee and offer free minutes. In recent months, a succession of countries have announced they are going to ban conventional fuel combustion engine (ICE) cars, including China, India, the UK, Norway and France. Some cities will call time on gas-fuelled cars even sooner than national governments: Paris is going free from noxious car emissions by 2030, Oslo is turning roads into bike lanes for its 2019 ban and Oxford will phase in its ban, even on road gritters and garbage trucks, between 2020 and 2035. GM is going all-in on EVs, Shell is buying up charging stations by the tens of thousands, and a rebranded Toyota doesn’t want us to call it a car manufacturer anymore; it’s a “human movement company” now. Canada may still be pushing dilbit pipelines and its consumers buying bigger vehicles, but it is pricing carbon. At the provincial level, the BC government’s decision to remove bridge tolls may be exacerbating traffic congestion, but some form of mobility pricing is expected to replace it. “Greenest city” Vancouver has joined Paris and 10 other cities in pledging to de-carbonize the “major areas” of their cities. Around a quarter of BC’s greenhouse gas emissions are from road transport. Car share operators, who have a frequent turnover of vehicles in their fleets, would seem well-placed to take a chunk out of that. Not everyone can afford to buy a new EV. They probably can afford to share one. However, there are only three all-electric carshare vehicles in Vancouver: Modo’s 2 Nissan Leafs and a Prius PHEV. 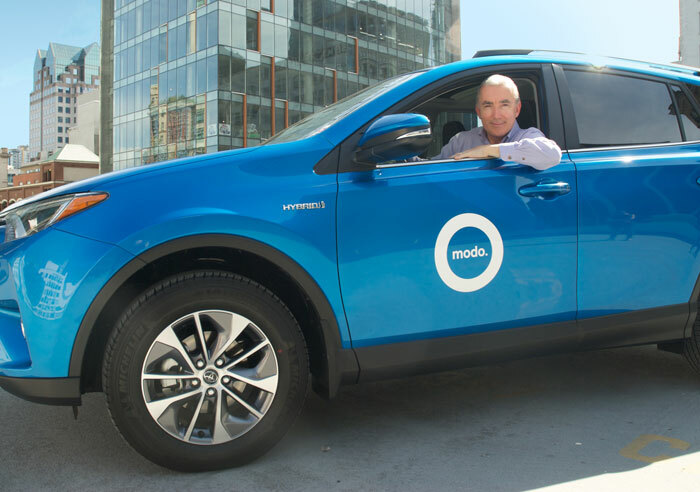 Patrick Nangle says Modo has been gathering data on the duty cycle of 40 Modo gas vehicles to build a business case with Fraser Basin Council and West Coast Electric Fleets for evolving its fleet more quickly toward EVs. Currently, 20% of Modo’s fleet is hybrid or electric. “There is some subsidy from provincial government, but it’s still more expensive. We don’t believe people will pay more. So how do we make sure that we get the right level of utilization, the right economics on the car. We want to introduce more. We think it’s the right thing to do,” says Nangle. Car2go already has exclusively EV fleets in Stuttgart, Amsterdam and Madrid with 1,400 vehicles in total. Yet the company retired its electric Fortwo Smart cars in EV-friendly Portland because the long charges meant the cars were out of rotation for too long. Last year, car2go switched its all-EV fleet in San Diego to gas after a major charging station provider went bankrupt. Parent company Mercedes Benz will be phasing out gasoline Smart cars for electric only, so the trademark tiny car will gradually be replaced in North American car2go fleets by the larger Mercedes GLA and CLA vehicles. Vancouver has around 250 public, level 2 charging stations and, importantly, as far as hardworking shared cars are concerned, only one DC fast charging station, which the City of Vancouver runs in conjunction with BC Hydro at Empire Fields. Fast charging stations allow for top-ups that take minutes rather than hours, but cost much more to install. BC Hydro has set up 30 fast charging stations across the province since its launch in 2012, with around 27 more being planned as part of “Phase 2” of the fast charge network rollout. By comparison, Amsterdam, which saw the launch in October of another free-floating, all-electric car share with 100 Hyundai IONIQ EVs, has 2,200 public charging stations with more fast chargers about to go into gas station forecourts. City of Vancouver climate policy analyst Ian Neville says that Europe’s 220 volt electrical standard versus North America’s 120 volt system makes them a “little more advantaged.” Amsterdam’s municipal government also has more control over land use, which helps when it comes to putting in kerbside charging stations. But Vancouver can learn from Amsterdam’s experience. BC Green Party leader Andrew Weaver has been calling on the provincial government to make it easier for industry to install charging stations and sell electricity. At the moment, businesses must register as a utility to resell electricity or give it away for free as Tesla has done for Tesla owners with its 10 BC Superchargers. “BC Hydro is the single biggest barrier to the introduction of electric vehicles in the province,” says Weaver. Self-driving, wirelessly charging, shared pods may become common on city streets in the 2020s, but Vancouver’s immediate focus is on fast-charging public stations as well as steadily adding residential charging in new buildings. By 2020, the City expects to have deployed eight to 10 EHubs, which will have DC Fast Charging units plus Level 2 stations for charging over longer periods. Given what we know about their impact on our climate and health, it’s clear that gasoline vehicles have outstayed their welcome in our cities. We are on the cusp of a huge transition in mobility. Please see March Common Ground for part two.